You can offer digital downloads as part of a package, and/or as an a la carte item. High Resolution Downloads will be downloaded by the customer at the same size you uploaded. For Low Resolution, we resize to 600px wide X the proportional dimension height. The image will be downloaded without any watermarks when purchased. To create a digital download package where various poses/images can be added, simply add the download product more than once. 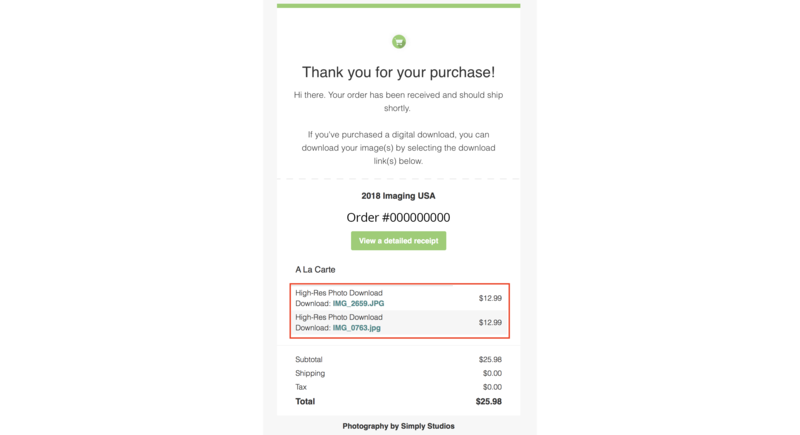 When a customer purchases a digital download, they will receive a direct link to their photos in their emailed receipt for their purchases, shown here. As of today, consumers can purchase any image in your gallery as a digital download. We understand some studios may not prefer this method and are exploring other ways to offer downloads.